The loss of natural teeth can hurt much more than a person’s oral health – they may struggle to eat food properly, speak clearly, or even feel confident in everyday settings. 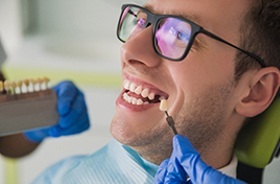 At Santavicca Dental Professionals, we want to help our patients regain not only their complete smile but their wellbeing and quality of life, too. In today’s world, dental implants are unmatched in terms of longevity, aesthetic value, and durability. To explore this revolutionary method for rebuilding teeth further, keep reading below or contact us today here in Lebanon, NH to schedule a consultation. 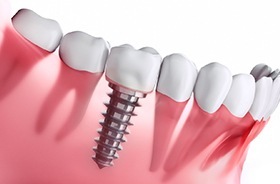 Dental implants succeed so thoroughly because of their comprehensive structure. They replace every part of the natural tooth, including the root that’s hidden beneath the gum tissue. By creating a solid foundation first, the restoration placed on top can last for decades at a time or even the rest of a patient’s life. Our recommendation for your new, custom-made restoration will depend on the number of teeth lost. Implant-retained dental crowns are the best solution for individual tooth replacement. They can fit between natural teeth without requiring any significant alterations of their structure, and the placed implant will preserve jawbone health as well! If a patient is missing more than one tooth, implant-retained dental crowns are still an option. Alternatively, if the teeth lost are next to one another, an implant-retained bridge may be an excellent choice. This type of restoration attaches over two placed implants on either side of the gap. The implants work as “anchors,” holding the bridge sturdily in place so that it can function as reliably as the original dental structure. Many patients who have experienced severe tooth loss don’t realize that dental implants can still be an option for replacement! Implant-retained dentures are a highly lifelike and cost-effective solution for numerous missing teeth. 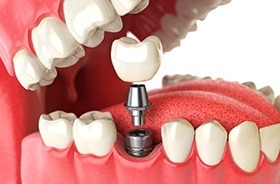 Unlike dental crowns, which require one implant per restoration, your customized denture can attach to a small number of placed implants throughout the mouth for an optimal fit.